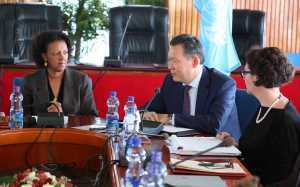 Addis Ababa, May 9, 2018 (FBC) – State Minister for Foreign Affairs of Ethiopia Hirut Zemene held talks with the delegation led by Kairat Umarov, Ambassador to the Permanent Mission of Kazakhstan to the UN and Chairperson of the Committee today. Following the trip by the Monitoring Group to Djibouti, Kenya and Somalia, the Group made its visit to Ethiopia aiming at consulting and seeking advice with the government of Ethiopia on UN sanctions on Eritrea. The government of Eritrea, however, has denied the group access into Asmara, according to the Ministry of Foreign Affairs. State Minister Hirut stressed the lifting of the sanction on the government of Eritrea should seriously assume the practical realities on the ground, while also emphasizing the fact that Eritrea has continued its disruptive role in the region and was not showing any signs of change. Ambassador Umarov expressed his deepest gratitude for the collaboration and cooperation the government of Ethiopia has shown and expressed the Group’s continued commitment to work closely with the government of Ethiopia.